Karen Khachanov produced a relentless display of aggressive hitting to end Novak Djokovic’s 22-match winning run and secure his maiden Masters 1000 title at the Paris Masters. The 22-year-old came into the showpiece as the underdog, but impressed with a confident all-court performance, which belied his relative inexperience, to beat the four-time champion 7-5 6-4. Khachanov became the first Russian to win a Masters 1000 title since Nikolay Davydenko in 2009 with his victory which also prevented Djokovic from celebrating his return to world No 1 on Monday with a fifth title in the French capital. Djokovic has returned to the form which saw him hold all four Grand Slam titles in the summer of 2016 but after back-to-back, gruelling three-set victories against Marin Cilic and Roger Federer, he was unable to reproduce the same level against a composed Khachanov. The 14-time Grand Slam champion failed to break Federer once in their three-hour contest on Saturday, but he began the final impressively as he secured the first break of the match, on his fifth break point. As the first set neared its conclusion, Djokovic showed signs of fatigue and Khachanov employed his aggressive game plan - hitting 18 winners in the opener - to break for a second time and move 6-5 ahead, before recovering from 0-30 to seal the first set. 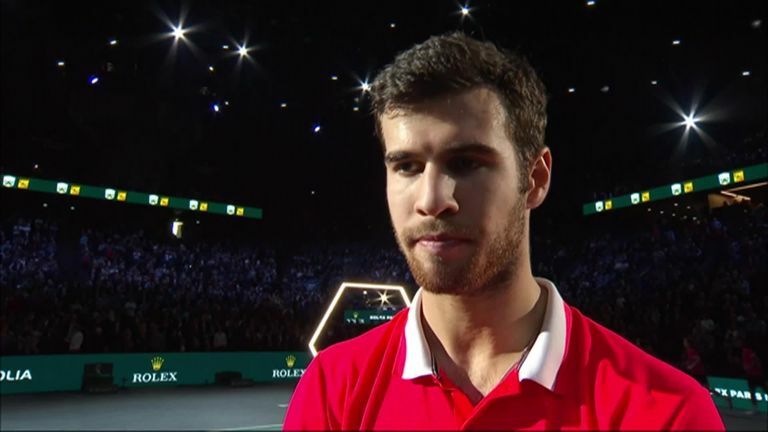 Karen Khachanov says his win over Novak Djokovic in the Paris Masters final was one of the biggest of his career so far. Khachanov continued his high level early in the second set and secured the crucial break in the third game as a rattled Djokovic struggled to come to terms with the weight and accuracy of shot coming from the other end of the court. Despite missed opportunities by Khachanov, who also won titles in Marseille and Moscow this season, for a double-break advantage, he maintained his composure to serve out for a memorable victory. Khachanov will now rise to a career-high world No 11 when the rankings are updated on Monday and overtakes Borna Coric as the second alternate for next week's ATP Finals in London.